Then she made...: Deal Of The Day - Chevron Goodness! 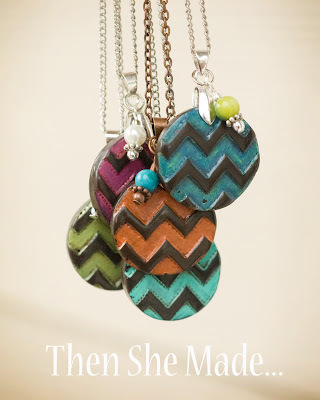 Deal Of The Day - Chevron Goodness! I'm not sure if this is happening where you live but for us we are just two weeks out before school starts. TWO WEEKS! I think summers are getting shorter! What this all means is that we are knee deep into back-to-school prep. We've been clearing out closets. Re-evaluating clothing needs and shopping a bit. As we gear up for the beginning of school I have had a few requests from my Miss M. She kind of sets the fashion standards around our home and one thing she wants is some fun new necklaces. I made her one by accident yesterday, she happily stole (with my permission of course) the necklace I did a tutorial on. 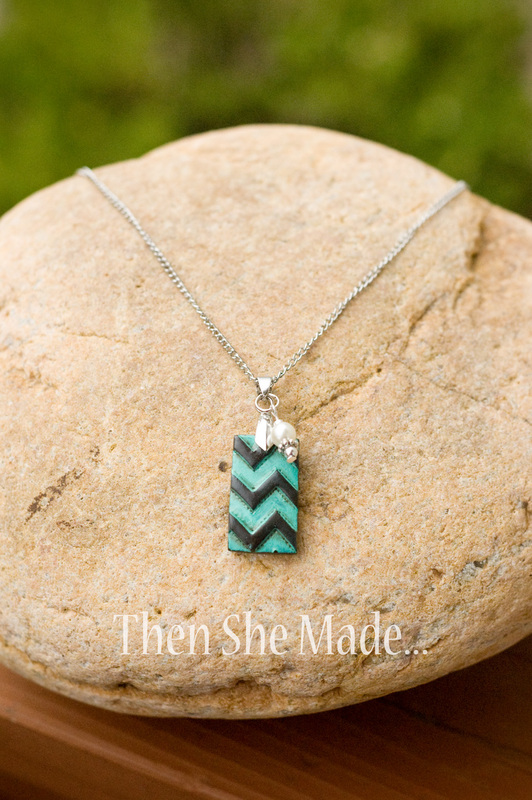 But she also asked for chevron necklace of some sort. 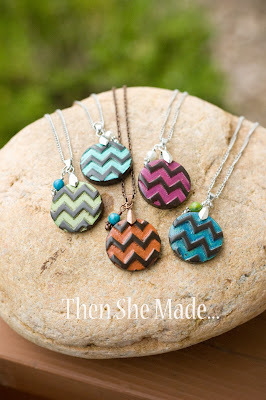 Chevron is all hip and happen these days. Yes, chevron seems to be everywhere so it was pretty easy for me to meet her request. The problem is I kind of lost control and didn't just make one. So, here's the deal - the deal of the day! 5 small rectangle Chevron pendant necklaces in various colors that need new homes. They are listed and ready to ship from my shop and I'm selling them for a discounted price of only $13.50. Be warned though, I only have one of each color so if you see it, and you want it, grab it! I don't plan on making more for awhile.